Well, not much has happened on this blog in over two years. I’ve been baking, but somehow stopped keeping track on here. So I’m officially announcing a hiatus for this blog. I might come back to The Professional Pastry Chef at some later point. In the meantime, if you’d like to know what I’m up to in the kitchen, check out this new blog: afterschoolkitchen.wordpress.com It’s not only focused on baking but on my experiments with food in general. Hope to see you over there! Do you like rolls? I LOVE rolls. My all time favorite are the Kaiser rolls from the “Nassafößa Beck” (Bavarian slang for “Nassenfelser Bäcker;” pronounce: Nauss-a-fu(r)-ss-a Beck; a bakery in the neighbor village of my home village). But since I came here, I have found a couple of recipes for dinner rolls, that could make me forget my passion for the aforementioned Kaiser rolls. You’ve already seen one example at the top of this page, a recipe that I discovered in Marjorie Standish’s Cooking Down East cookbook, almost a year ago, for Thanksgiving. I found another one in the latest issue of Cook’s Country. 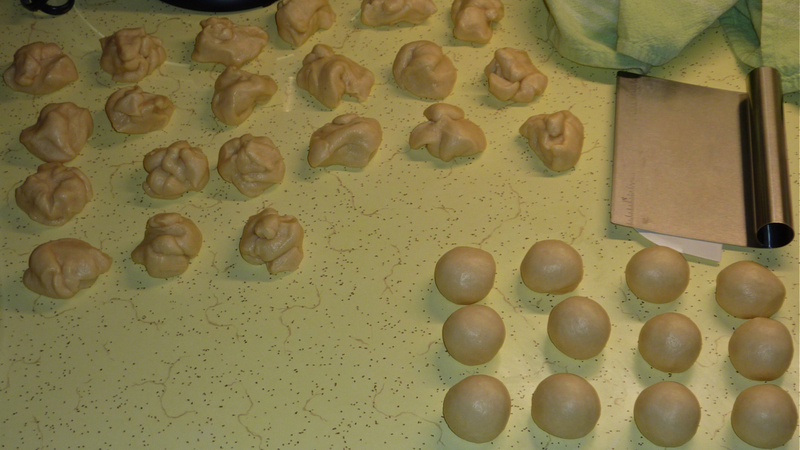 Well, the article was really about baking dinner rolls in the shape of Cloverleaf Dinner Rolls, using a muffin pan. And of course, they had developed a recipe that works perfectly to get this shape. 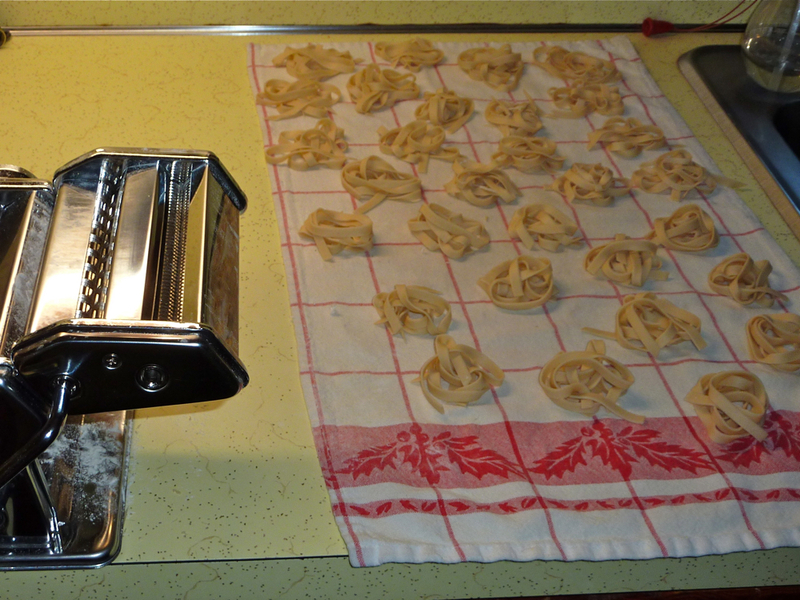 Since I LOVE working with yeast dough (as you might by now be able to tell from this blog), and I found the picture of the rolls very appealing, I decided to give it a try. And bought a muffin pan. Yes, shame on my, I didn’t have a regular-sized muffin pan before. Only a pan for mini-muffins. C’mon, I can get muffins everywhere, I don’t really need to also bake them. While I really like muffins, I kind of don’t really want to make them at home. OK, maybe now that I have the pan that’ll change. Who knows. 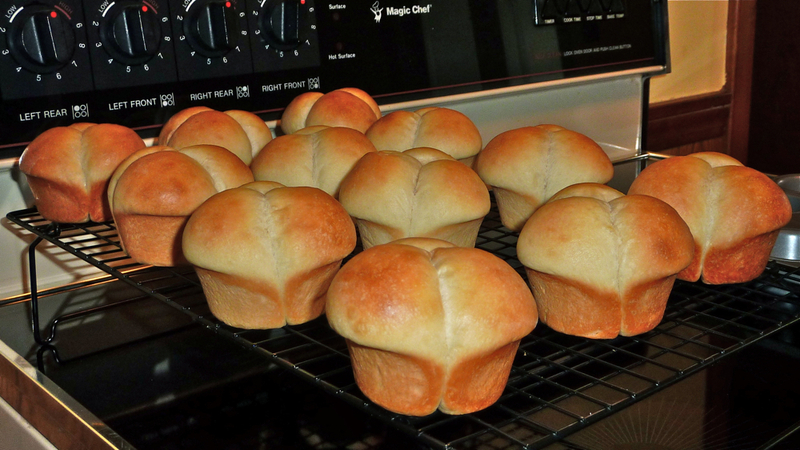 Anyway, for no particular reason, just for fun, I decided to bake a batch of Cloverleaf Dinner Rolls, today. The article said that you can really use ANY old yeast dough recipe, it’s the shape that matters. 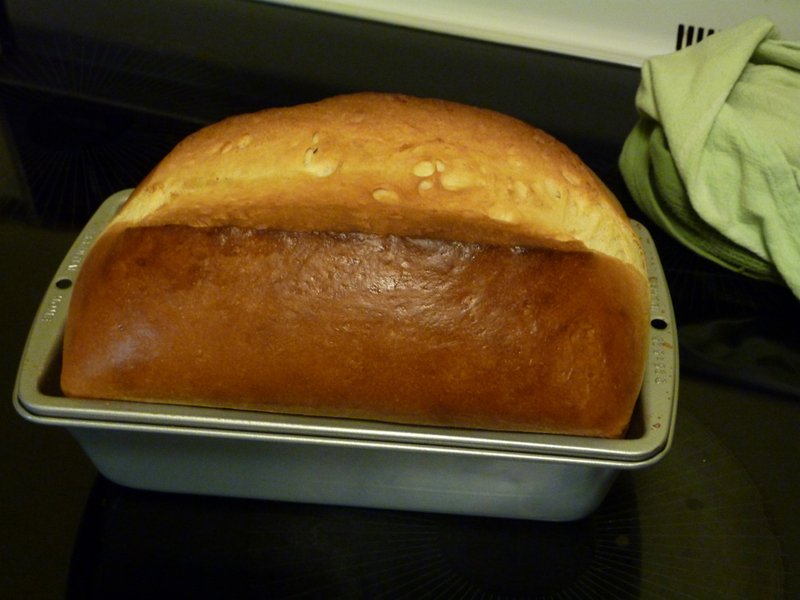 I would recommend either a nice dinner roll recipe or, even better, a brioche recipe. 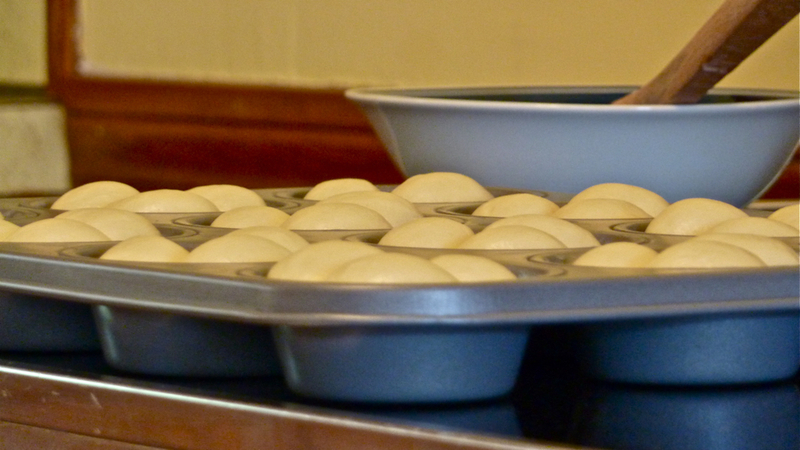 Divide into 36 equal sized pieces of dough, roll into balls, set three balls of dough in each muffin cavity. Here’s a couple pictures, showing the process of how to make up the rolls. Ain’t they beautiful? I underbaked them slightly. They taste a little yeasty, but that’s fine with me. And I’m going to freeze a bunch and will have to reheat them, anyway. Since I really like a buttery taste in those dinner rolls, I’ll try my trusty brioche recipe, next time. 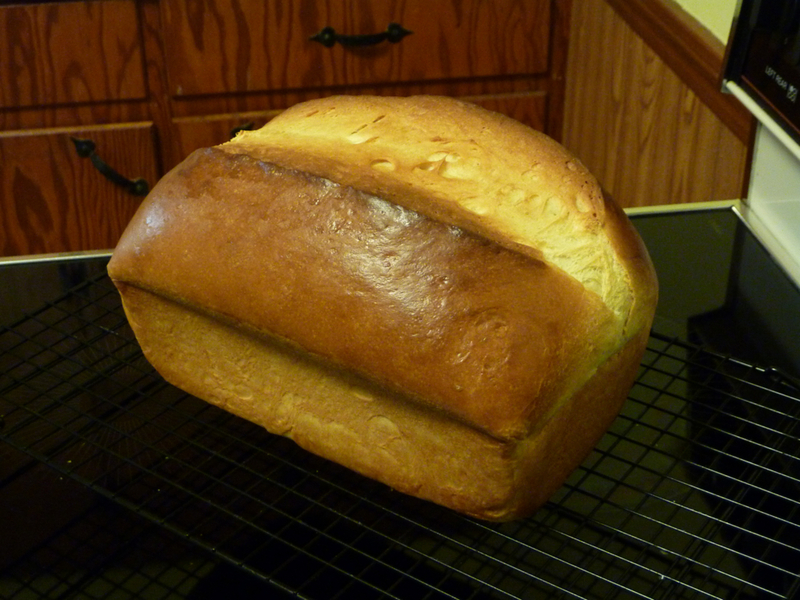 Ah, speaking of brioche, I should write about those, at some point, soon. Don’t let me forget about that! 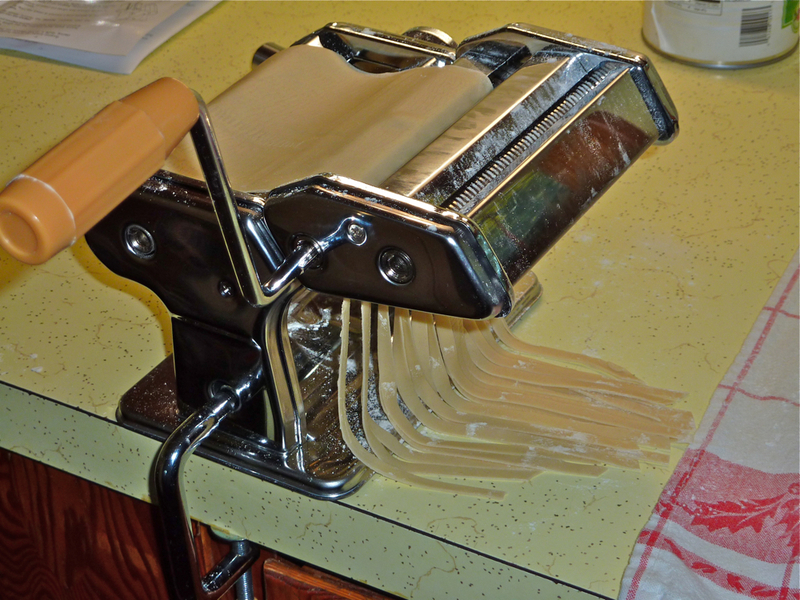 Pasta is one of those things that my master started to make, back in the day when he had his pastry shop. In his rural Bavarian area, his was pretty much the only shop where you could get small-batch-made real Italian-style semolina-pasta (oops, sorry for all those hyphenated words, I got a little carried away). OK, this is more like an appetizer-post, since the actual content is pretty thin. I’ll be back with more pasta! OK, this is only marginally pastry-chef-related, but still somewhat relevant. Ever been bored with store-bought granola? I am. There’s only so many brands of granola, around here, and I think I’m through with them. I found my favorite, but it’s still boring to buy the same stuff all the time. 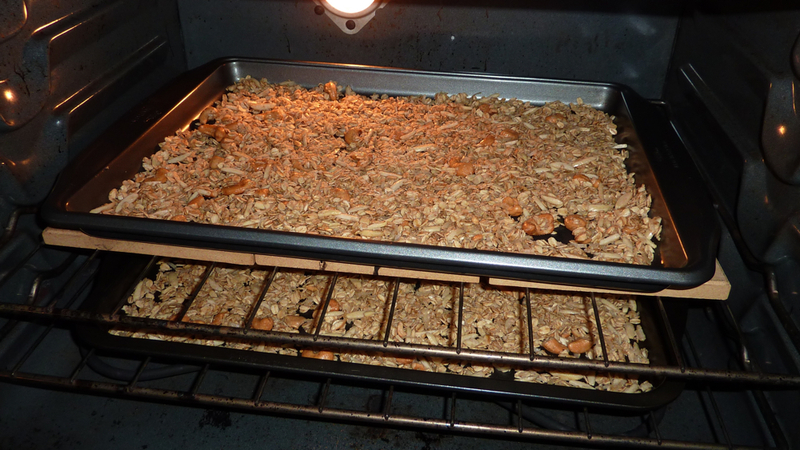 Since I was out of breakfast food, I decided to do my own granola. A quick google search revealed Alton Brown’s recipe for granola which looked like a reasonable start for my own experiments. With a lengthy shopping list, I went to my local health food store to buy the ingredients in bulk. 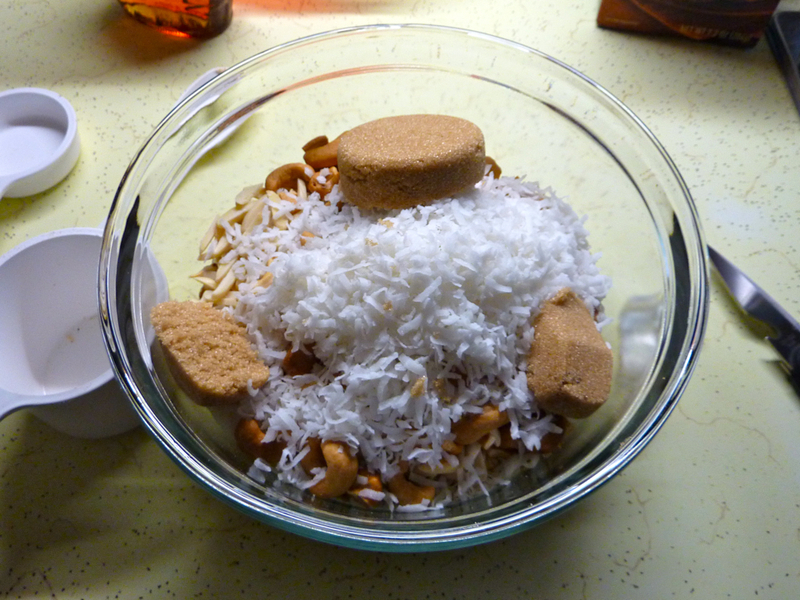 Back home, I started the recipe and realized that I only had light brown sugar, and no vegetable oil. Never mind, then, butter tastes better, anyway. So, I melted the butter and mixed it with the maple syrup and the salt. Turns out that 3/4 tsp of salt makes the granola pretty salty! If you like that, fine. If not, cut down the salt to 1/4 to 1/2 tsp. 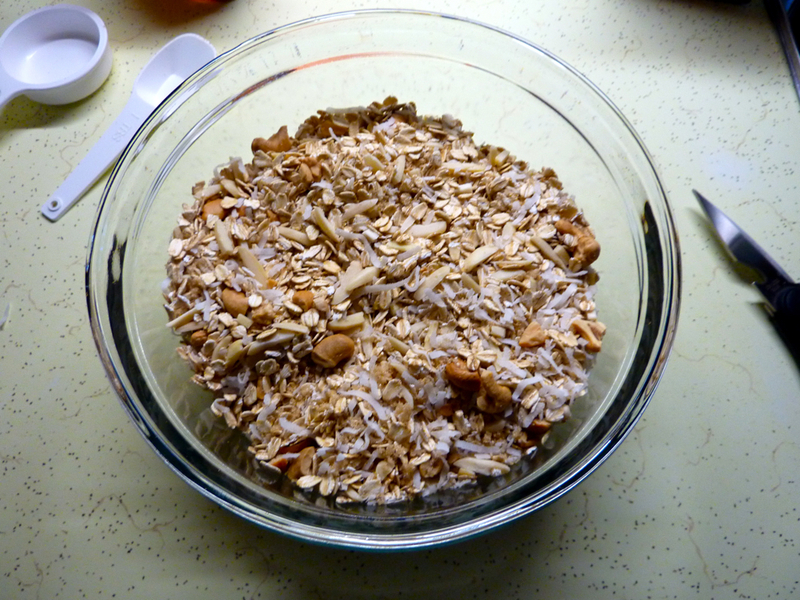 Here a little picture gallery of my granola at different stages. 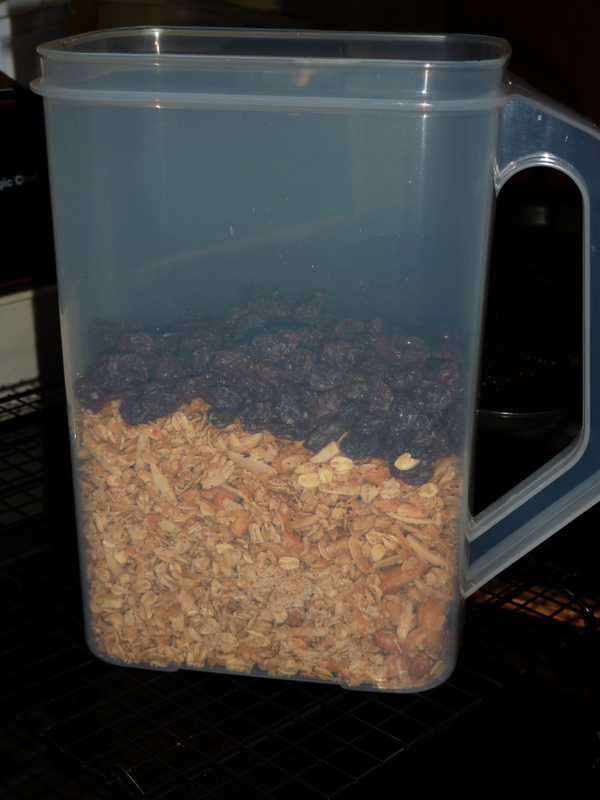 After the roasted granola had cooled off to room temperature, I put it into my shiny new Walmart-granola-dispenser and mixed in some raisins. That’s it. Using the sponge method (dissolve the yeast in about half the water, add half the flour, mix, let rest, then add remaining water and flour, knead, add salt at the very end), we get a very soft, moist dough that is very hard to knead by hand (because it’s sticky!). Stand mixer recommended! Make up into equal sized “ropes” and let them proof on a kitchen towel. Transfer on a pizza peel (or the likes), using a knife, cut the top a couple times and stick in the (hot! ~480ºF) oven (on a baking stone!). Use steam for the first 10 minutes. Well, I’m still working on the crust appearance. And I need a better knife. My old bread knife doesn’t really cut the soft dough. That’s a job for the good old Swiss serrated paring knife (which I haven’t found in a local store, yet)! At least, the crumb isn’t too bad. The holes could be bigger, but it’s nicely risen, moist and white. Earlier attempts in my career have been flat, dry, and gray on the inside. 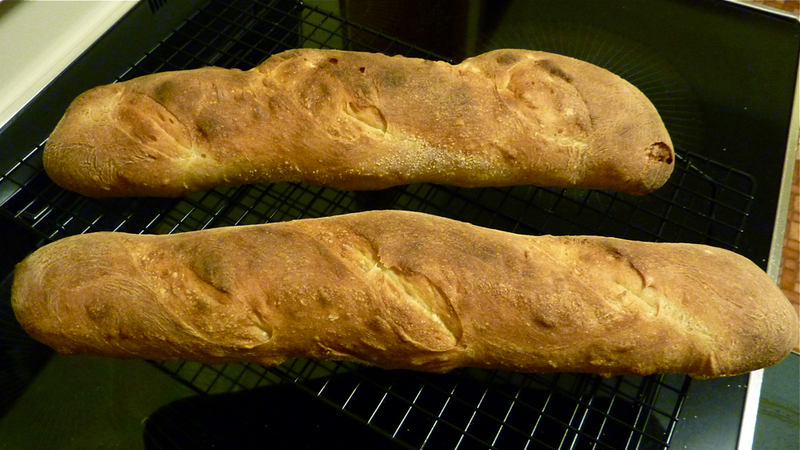 So, this version is definitely a step further in my mastery of French Baguette (which, according to my master, is one of the hardest challenges in baking). 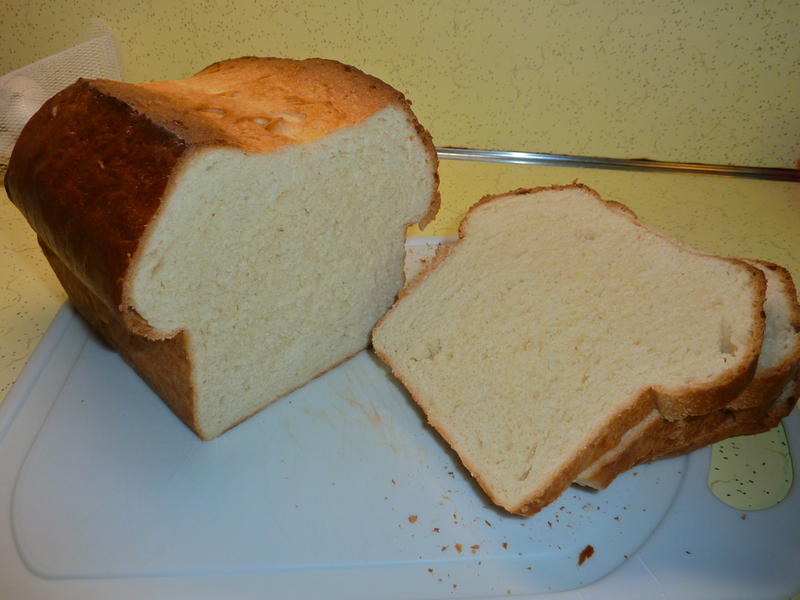 Another kind of bread that I learned to bake in Germany is “Buttertoast.” That’s just simply white sandwich bread, with a nice amount of butter in the dough. Ah, you want this formula, as well? Sure, why not. Again, use the sponge method to get a nice texture. Let the sponge ferment for 30 minutes, add the remaining ingredients, knead until gluten is developed (window test, or just look at/touch the surface of the dough). Let rest for 20 minutes, knead by hand to work out big air bubbles. Make up, pan and proof for 20-30 minutes. Brush with whole milk, slice the top lengthwise and bake at 395ºF for 35-40 minutes. 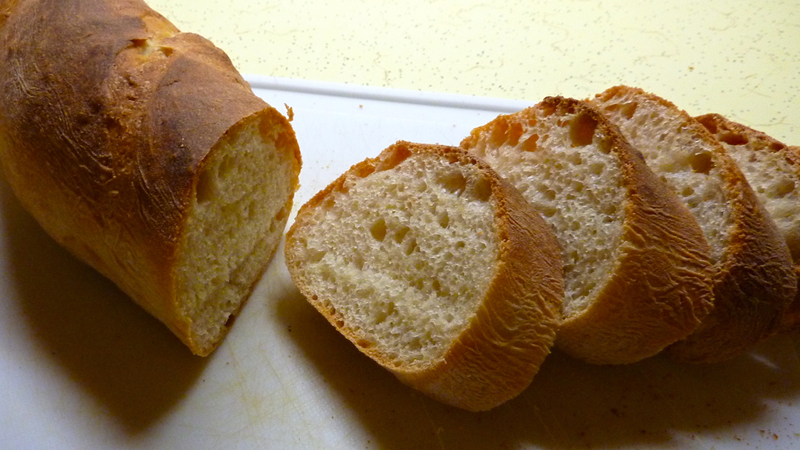 You might have to turn down the heat halfway through or cover the bread to prevent excessive browning. I would recommend using 500g bread flour, I used 600g, that’s a little too much for a regular loaf pan. Also, I did not work the dough enough. You can see that at the top, there are still a couple of larger air bubbles. Make sure to really beat the dough up and get that air out! After baking, slice into half inch slices and freeze. Can be toasted out of the freezer. If you try the recipes, please let me know how they worked out for you! Another potluck with my friends and colleagues from the university happened. As always, that caused me to think for days what I’m going to make. In the end, the latest issue of Cook’s Country coming in the mail helped make the decision. A rather lengthy article described the overhaul of a traditional Appalachian dessert, the Blackberry Jam Cake. The author reported all kinds of problems with different recipes taken from several cookbooks and what the test kitchen had to change in order to get rid of all the flaws in those recipes. Well, I thought this should be a foolproof recipe, so I just went ahead and followed the directions, disregarding what I knew about creating cake batter and so on. I was a little worried, when I took the sponge out of the oven and it had shrunk away from the baking ring a little bit. Also, it slightly collapsed, while it was cooling down. In order to prevent further shrinkage, I turned it upside down, so that it would hang in the ring upside down and not collapse further. I did not think that the amount of butter in the recipe would prevent the cake from sticking to the parchment paper. As soon as I had turned it upside down, it was no longer connected to the ring or the parchment paper, so it just fell onto the kitchen towel. Not good. But it was cooked through all the way, and the bottom of the sponge didn’t look too bad, so I just left it on the rack to cool off. Meanwhile, I started preparing the caramel for the caramel buttercream. The caramel consists of brown sugar, milk, flour and cornstarch. It has to cook until it considerably thickens. The recipe said, cook it over medium heat for about 7 minutes. Yeah, not with my smoothtop range. It took about twice as much time, and I had to switch to high after 7 minutes because it was heating up so slowly. Once nicely thickened, I took it off the heat and let it cool down a little bit. Carefully tasting it (trying not to burn my mouth), I noticed a very prominent floury taste. Crap. That was not supposed to be in there. Well, anyway, if things went terribly wrong, I could just do something else, entirely. I let everything cool off over night, and in the morning first whipped the buttercream to make it light and fluffy again. Then I cut the sponge in half. No surprise, it was kind of dense. Not really a nice and fluffy texture. But the crumbs tasted OK, so I just went ahead and assembled the cake. Took longer than expected because the buttercream started to curdle a little bit (caramel and butter apparently have different opinions about how long it takes them to reach room temperature after spending a night together in the fridge). Not a problem for my stand mixer! Several minutes later, everything was smooth again, and I could finish the icing of the cake. 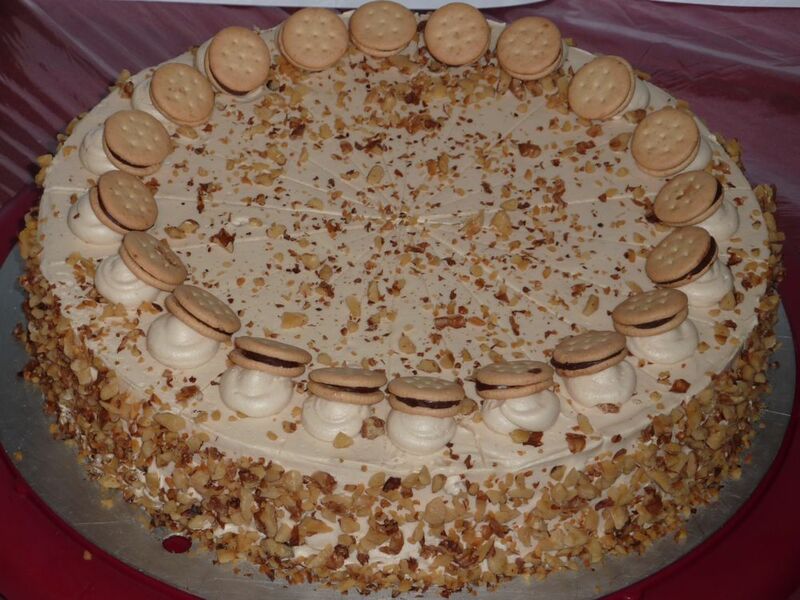 Then chop up some walnuts, roast them in a pan, and off we go, decorating the cake. Wanna see? Anyway, when we finally cut the cake, in the evening, the color of the sponge looked greyish-blue, and the bottom layer had this nasty wet and dense spot that you always get when your cake collapses after baking. Those issues were well known by the author of the recipe (there were even pictures of them in the article) and supposed to have been fixed! They had substituted baking powder for baking soda because of the discoloration (apparently that doesn’t really matter), and supposedly had adjusted proportions and procedures to prevent the cake from becoming a dense slab of baked batter. The final product in “artistic” presentation. OK, this is not going as planned. At all. At this pace, I will never make it through the book. Why? Well, life happened. Lots of stuff to do. 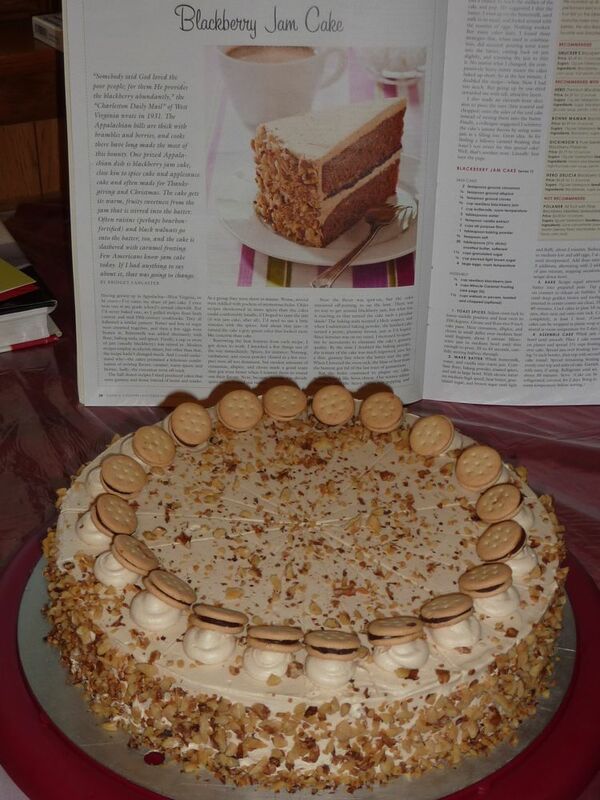 And also, I found another professional baking book, that I like even better then The Professional Pastry Chef. It’s Wayne Gisslen’s “Professional Baking” in the third edition. It’s a little more “sciency” than my old edition of The Professional Pastry Chef. And then, I have all my old recipes back from Germany. And in addition to that, I have a bunch of other cook books and I have a subscription to Cook’s Country, which also provides me with a lot of interesting ideas and recipes. That’s why I’m going to open up this blog to pretty much all my baking activities. Also, I’ll stop taking pictures of all the steps. At least most of the times. I think. Well, I guess this will vary. Anyway, I will blog about all kinds of different baking adventures. I will not reserve this blog to only the best, nicest looking and awesomest tasting things, but I will also report about failures. Hopefully, these changes will make the blog a little more lively and interesting to read.